A company that transforms its IT infrastructure no longer has to rely on rigid, manual, siloed, legacy technologies. It sees a boost in IT operational speed, efficiency, scale, and cost effectiveness – tasks are automated, processes streamlined, and resources are freed up. Those IT-level improvements fuel a larger-scale digital transformation, allowing the company to thrive in today’s digital economy. It is able to out-innovate, out-think, and out-pace its competitors – ultimately becoming the disruptor, not the disrupted. 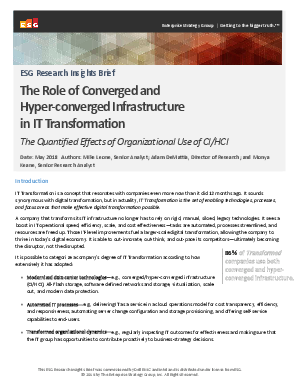 Download this study commissioned by Dell EMC and Intel® to learn more.